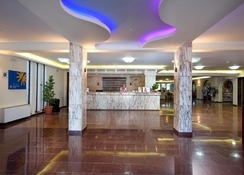 Magna Graecia Hotel is a spectacular hotel situated in a picturesque location. It comprises 154 room and four suites, which make guests feel like a home. this magnificent hotel is the best place to stay, especially for the younger couples and group of friends due to its vibrant atmosphere. The restaurant in the hotel offers appetizing breakfast, lunch and dinner in Mediterranean style that will surely lure the foodies. If you want to relax, then the wellness center in the hotel is right place to step in. Or go to the tennis court if you feel energetic. The best and the foremost aspect about the hotel is its nearness to numerous beach that make it convenient for the beach lover and water sports enthusiasts alike. All these facilities and of course the hotel’s fabulous location makes it a delightful stay for guests. Magna Graecia Hotel is ideally situated in Palaiokastritsas, Greece. It is set amid lush green surrounding, which offers a peaceful and serene atmosphere to the hotel’s guests. Additionally, guests can enjoy magnificent views of the mountain right from their room window. The Loannis Kapodistrias Airport is only 11.7km from the hotel, making it convenient for guests to board their flights on time. There are many bars, restaurants, sport clubs and cinema theaters near the hotel that will make it very convenient for guests. Guestrooms in Magna Graecia Hotel are divided into following categories – single room, suite experience, family superior room sea view, family superior room mountain view, standard double sea view and standard double mountain view. Some of the common facilities in the rooms include Wi-Fi, LCD TV, air-conditioning, porter service, mini-fridge, 24h reception and daily housekeeping. Guests can enjoy scrumptious breakfast, lunch and dinner in buffet style. the restaurant has long menu that encompasses Mediterranean as well as international delicacies. The staff members in the hotel are friendly and professional, they will give you suggestions to choose the best food and drink combinations so that you can have a delectable dining experience. Or take advantage of the in-room dining service. The resort features a beautiful outdoor pool, where you can swim and bask the sun. At the pools, you will be facilitated with pool towels and sun loungers, where you can relax after a swim and have refreshing drinks. Hit the tennis court if you feel energetic. Get yourself pampered in the fully-fledged wellness center, where you will find expert masseurs who will give you massage and beauty treatments from head to toe. Arrived at Hotel before check-in time, no issue told us to get some lunch in the restaurant . Room ready 20mins later. Room changed to family room as we had grandkids with us. Food was good , pool and bar area great , hotel staff were accommodating , nothing too much trouble , had nothing to complain about. Great holiday and stay all around. We paid a very good price for an all inclusive holiday, including our stay at Magna Grecia. It was a nice location, and within walking distance of the beach with a favourite local beach bar. Hiring a car was easy from the hotel, and really added to our touring Corfu by day as well. The restaurant manager really put himself out to help me with my food allergies, really watching out for me. Highly recommended.